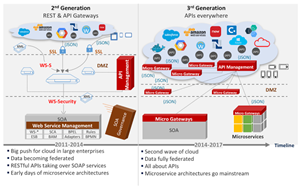 Earlier in the year, June to be exact, I published the OTN article 3rd-Generation API Management: From Proxies to Micro-Gateways -based on a concept I presented in an Oracle OpenWorld 2016 Presentation titled API management in the year 2026. In summary, the article talks about how in the digital era requirements have changed when it comes to getting access to information. Fact that modern applications demand information in real time and expect it to be available 24×7, and also the side effect of cloud adoption which is causing information to become more and more federated amongst multiple cloud applications (from different vendors) and on-premises systems -as they won’t go away that easily. The article continues by explaining that although REST APIs play a critical role in providing such critical access, the underlaying technology stack that have traditionally enabled SOA architectures, typically based on monolithic middleware, will struggle to satisfy the aforementioned needs. The article concludes by explaining that a new form of platform, one that is light-weight, portable, hybrid and cloud-agnostic, REST/JSON native, Microservices Architecture ready, a 3rd generation, is ultimately required. You might recognised the following picture from some tweets and articles: Read the complete article here.